Great Granny Squared quilt top completed! I stayed up until 3 am on Friday night (Sat morning) to complete this top. There is a point where you get near the finish line and you tell yourself – just keep going. You are too close not to just finish these borders and have it DONE. I was at that point Friday night. My son tried his best to keep up with me, but he fell asleep about 30 minutes from the finish line. We were both pretty tired on Saturday. 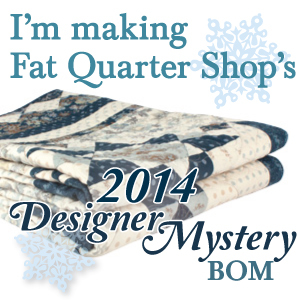 What about you – how close do you get to a quilt finish where you will just grind it out? 10 min? 1 hour? 3 hours? I’m happy to show off the finish… Great Granny Squared pattern by Lori Holt from her recent book by the same name. Fabric is from collections including Birds & Berries, High Street and Bluebird Park. Background is a light gray polka dot on white from Vintage Modern. A charm pack of Grunge basics (variety of colors) was used in the border to mix with the prints. A little close up of the corner. I do have a problem however. I don’t have much of my background left and I would have liked to used it for the backing. I can’t seem to find it on eBay, Etsy or my favorite online shops either. My grand plan is to use another layer cake from High Street, the leftover layer cake squares from Birds & Berries and piece a big GGS block on the back. I just need to decide on a complimentary fabric to make up the difference. Any suggestions? Pull out the yellow or green and find yardage of that perhaps? Or the light teal blue? So, I’m really not ready to send this off, but so close! Thanks for stopping by today! I’m looking forward to switching gears a bit and working on my languishing BOM projects for awhile. All the best for a great week! Your Granny Squared looks fabulous. Well done Jennifer. It looks fabulous Jennifer – well done!! 11pm is about my limit – after that I tend to make too many mistakes!! I am just about to embark on this quilt too! Quick question – did you press your seams open as Lori recently mentioned on Instagram for this project? Hi Trina! Thanks for stopping by! As to your question … no, I almost never press my seams open. It takes longer than pressing to the side and I tend to burn my fingers more doing it. I followed the instructions in her book and the seams just nested fine for me (for the center portion of the quilt). I wasn’t bothered at all by the bulk of the seams. Unfortunately, I haven’t jumped on the Instagram wagon yet, so I haven’t seen that post from Lori.